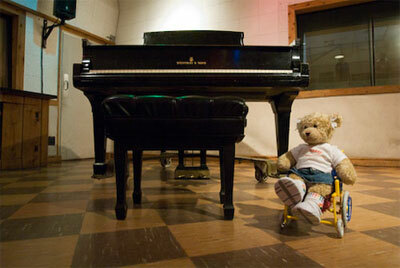 Cherrie at Studio B, the historic RCA recording studio in Nashville, Tennessee. There’s a reason that Nashville is nicknamed “Music City” – there’s music everywhere. Literally. In the Honky Tonks, along Music Row and even on the street corners. It’s a lively and creative place, where you never know who you’ll run into, and where your tour guides and servers are often song writers and performers. It’s a great place for anyone who enjoys music — any kind of music – but Cherrie especially enjoyed it because she’s a huge country music fan. Cherrie had a great time at the Grand Ole Opry (where she saw Charlie Daniels) and had fun visiting the Country Music Hall of Fame; but her favorite part of her Nashville visit was the tour of Studio B, the historic RCA recording studio. In its heyday the studio played host to some recording giants, including Roy Orbison, Dolly Parton and even Elvis. The tour is operated by the Country Music Hall of Fame, although the studio itself is located about 10 minutes from the museum. The tour departs from the Country Music Hall of Fame, and Cherrie had no problem accessing the lift-equipped bus that took us over to Studio B. Once we got there, Cherrie was directed to the accessible entrance and she could roll around and enjoy all of the areas on the tour. It was fun to see all the old pictures and hear stories about the artists that used the studio. The best part of the tour was when the tour guide played some rare video footage from an old recording session, followed by an audio clip of an Elvis recording session – complete with out takes! It’s a great tour and Cherrie had lots of fun. Best of all, she had no problems wheeling around, and the tour guide was very accommodating and made sure she saw everything! So if you’re ever in Music City, give it a go!